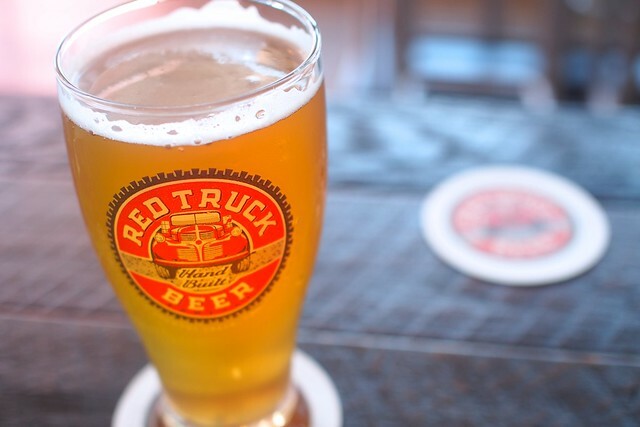 Strathcona—Long in the works, Red Truck Beer Company's big, shiny, and brand new brewing facilities are finally fully open. 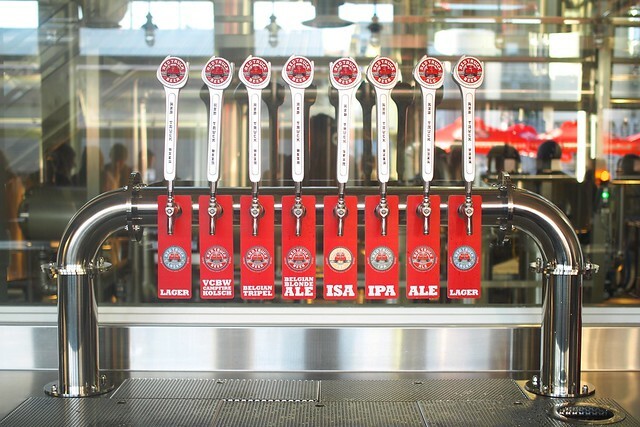 Centred in the still up and coming industrial area (historically known as Brewery Creek) that currently meets at the triple nexus of Strathcona, Mount Pleasant, and Olympic Village, the American style diner meets craft brewpub hybrid looks very bright and appealing right off the bat. 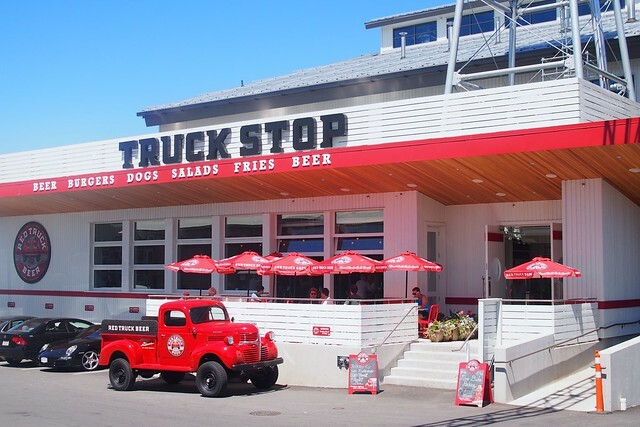 Not quite the craft brewing tasting room we're now accustomed to, the counter service eatery is heavy on the truck stop diner theme with its shipping container walls and light industrial decor. The tire and pump washroom sink is a particularly nice touch. The lengthy food menu is intriguing with a deep variety of options from hot dogs to egg foo yung and "blue plate specials". 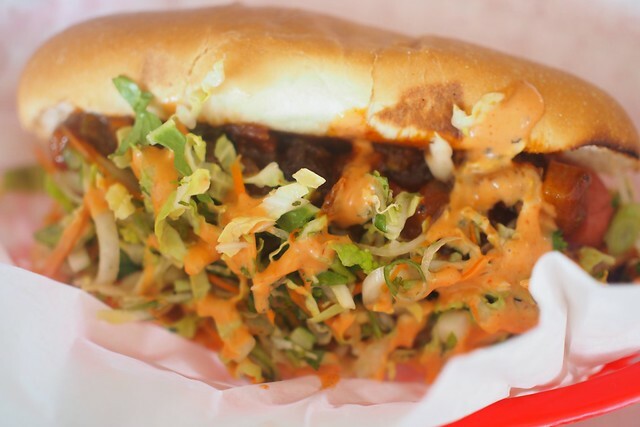 I munched on a Saigon hot dog (with barbecue pork belly, slaw, and Sriracha mayo) and found it quite tasty with a mild kick to it. It's a messy snack but fairly pleasing as far as hot dogs go. 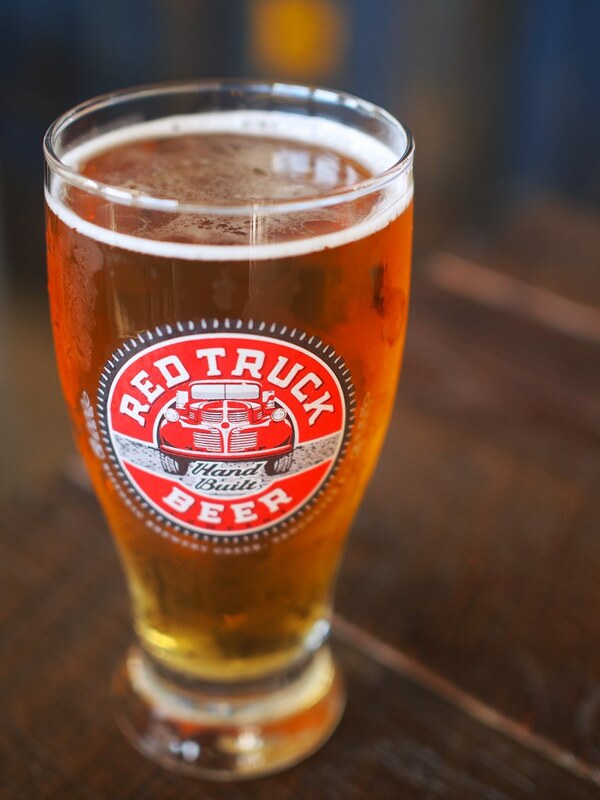 As for the beer, I was already fairly very familiar with Red Truck's ubiquitous reliable lineup of beers from over the years. I drank four of their brews: the Red Truck Ale, India Session Ale, Belgian Blonde (above), and VCBW Campfire Kolsh. All were reliably solid and refreshing in their stark tastes. The Blonde was easily my favourite with its crisp, smooth flavours. The Ale is a mild, appealing, and an easy drinking standard. I think the snack options are a little more appealing and a better deal than the more substantial meal items. 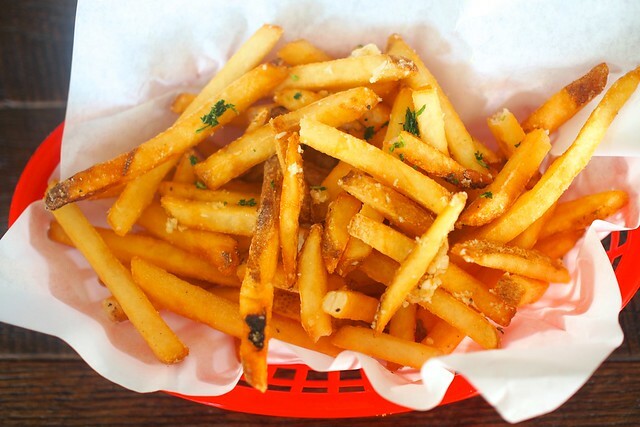 The garlic fries in particular were a perfect treat paired with your beer and an easy pick for three bucks. I found the ISA (above) also rather mild yet quite refreshing. The Kolsh was a crisp tasting German style pale lager (Kölsch). The beers are good and along the safer more broadly pleasing varieties (on a bigger scale) than other local craft breweries. 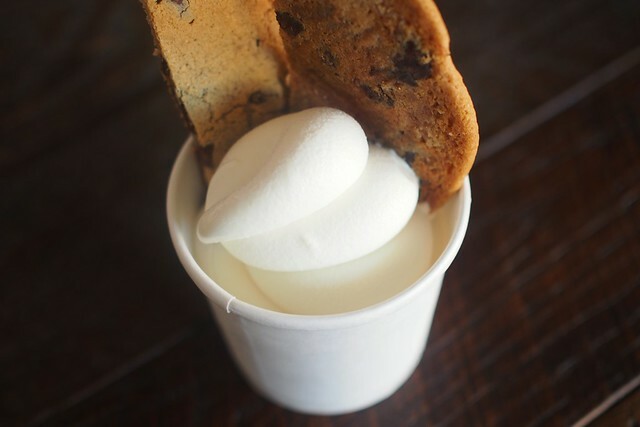 I was tempted to try the soft serve ice cream (with a chocolate chip cookie) and was pleased by the satisfying texture of the dessert as it cooled me down. 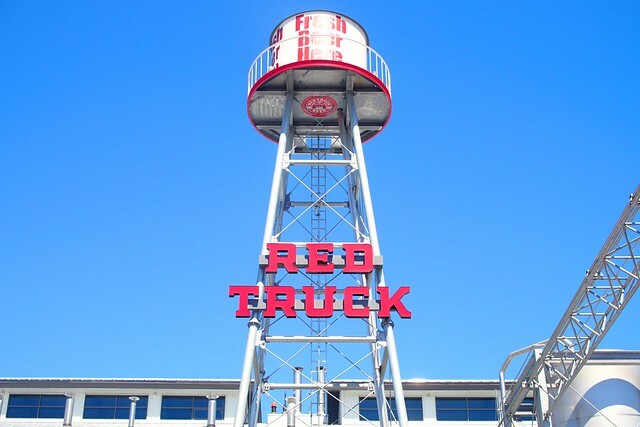 Red Truck already feels like a winning neighbourhood style brewpub with its retro nostalgic twist, small patio, and industrial aesthetic. 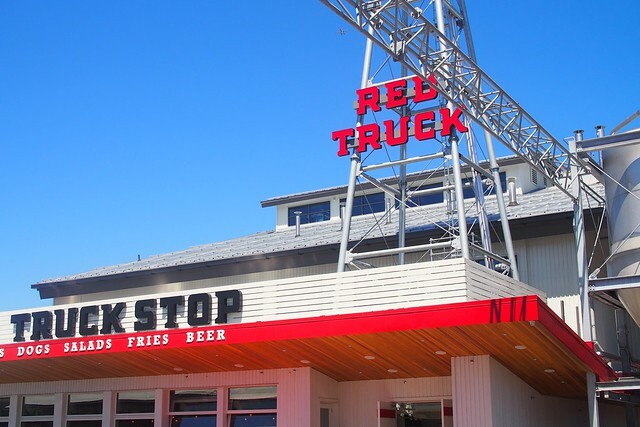 Everything fits the overall theme and brand they're going for as it fairly successfully recreates the modern diner experience in a brewery setting.